Typical, the first away win of the season and it wasn’t on television. 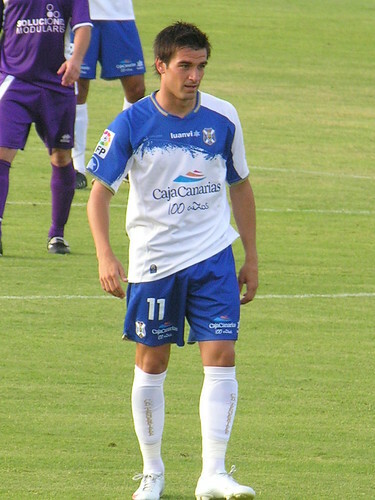 I got some odd looks as I leapt up and punched the air in the pizza parlour when Natalio (pic) made it 2-0 at Villareal B, they were oblivious of my radio feed via my MP3. I spent most of the second half sheltering from the first wave of the tropical storm battering Tenerife, but once the final whistle went I could only see blinding sunshine as I splashed through the puddles and torrential rain. What a difference that win has made, now we are off the bottom of the Second Division in 19th, 4 places up from the last spot. Nino was again the main man scoring just on half time after Omar pounced on a defensive blunder to set him up. With nails being eaten as a side order to my pizza Natalio ensured the points with a last minute strike thanks to Nino’s cross. The only blemishes were 4 more yellow cards, Ricardo and Natalio will have to sit out next Sundays home game with Granada but hopefully the new confidence will continue to drive us up the table.